Thursdays are usually reserved for research or reflection/sermon writing for me. It’s never the most exciting day, but it almost always serves as a day that I come away from having been mentally and spiritually challenged. But it’s never something I’d really write to tell anyone about. Yesterday, however, was brilliant. After throwing together 1200 words on the spirituality of ecology (it’s as exciting as it sounds) I drove up to North Phoenix. I had been invited by a new friend, Alex Feldman, to come and speak for a scouting troop that he established in 2011. Unlike any other scouting group I was familiar with, this one was made up of girls and boys who ranged from three years old to seventeen. And almost every one of them was an international refugee. Alex asked me to come and share my experiences as an American Christian pastor. It was a small piece in a larger series that he designed to introduce different faith leaders to the group. The idea was to share stories, hear different perspectives, and allow the group to ask any types of questions they’d like to about world views, religious perspectives, or even tattoos (apparently). I arrived and was immediately escorted into a room where I was the minority, with each scout introducing themselves, their name, their country of origin, and their faith heritage. And so I shared my little story about the life and faith of a white guy from America, the whole time bored with my own story and eager to hear theirs. I tried to integrate their experiences with the overall human experience, reminding them of the universe’s need for each of their stories. If nothing else I was hoping something I said reminded them that their value was immense, no matter what another person might say to the contrary. Q and A time came, and after the questions about my tattoos, I was again blown away by the insights and rawness of the questions children and teens ask. They asked about what I thought of their religions (I loved them), and about how my faith tells me to care for people (there are no boundaries I told them, but my heart was most with folks who feel like they are on the outside looking in). I told them my Christianity was not everyone’s, and that they would encounter people who used the same title that I do, but teach about separating different people and treating people who were most like them better than others. I don’t think they needed my to tell them that part. It was the quickest 90 minutes I’ve had in a long, long time. In the end, the group broke up, went into the next room and shared snacks and jokes and laughter. They offered me a chocolate donut and some chocolate milk, an act of great discernment and hospitality which might readily accepted. Alex walked me out to my car where I thanked him four or five times for the opportunity. A day later, I doubt any of them remember my name, let alone what I said to them about anything. If they do, I hope they heard that I loved them, their stories and their faiths, and that I saw each of them as sisters and brother; Muslim, Baha’i, Sikh, Christian, some amalgamation of them, or none of the above. I know that my soul was stretched last night, more than any article or book I had read earlier that day. I am a speck in an enormous story that’s unfolding all around me, and I need a greater awareness of it. I must forcefully reject the philosophies of fear and hatred that some of my contemporaries spin as acts of security and safety. I was convicted that I must be a part of a better way so that these next generation of humanity has a wider lane towards peace and unity than what we are offering now. 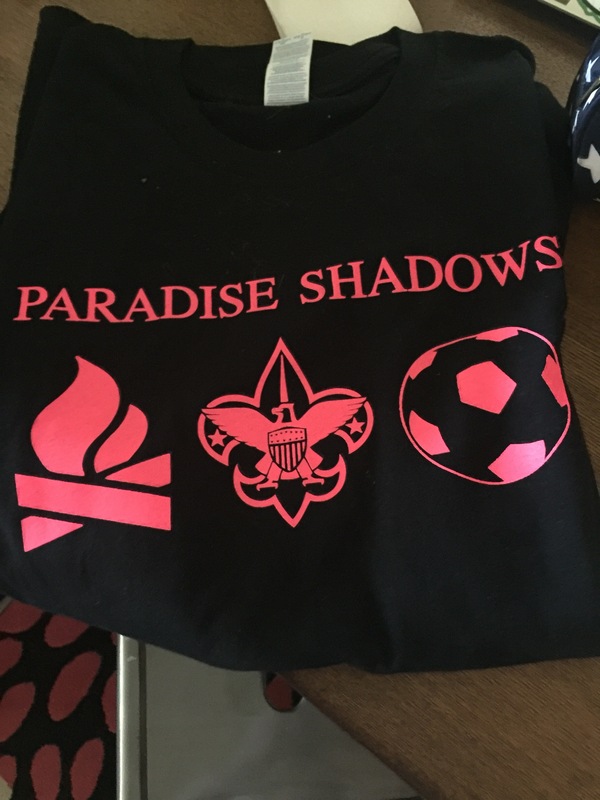 Thank you again to Alex Feldman and the Paradise Shadows Scouts, you were a gift to me last night.